FEB 26, 2012 Ohio – Using of Modern technology with perfect management was seen on demolition of a bridge in the USA. 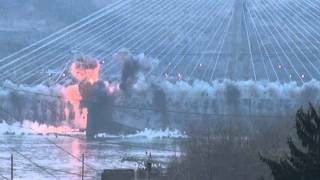 Spectacular footage showing a 1,584-ft-long bridge being demolished with explosives has surfaced on the web.Following a series of controlled blasts, the 83-year-old structure linking Ohio and West Virginia was successfully brought down using 70kg of explosives in just a few seconds on Tuesday. The explosives were strategically placed in 136 places on the bridge. Ohio River’s Fort Steuben Bridge closed in 2009. It was destroyed after local safety officials noticed the bridge was significantly deteriorating. The video, captured by local authorities in Steubenville, Ohio, was slowed down to capture the momentous event.